A number of voluntary schemes have been set up to address the environmental impacts of palm oil, which has experienced rapid growth in demand and has been identified as one of the leading drivers of deforestation and biodiversity loss worldwide. While there is some variation between them, none of the schemes has been very effective in slowing down deforestation. The range of schemes, and the existence of different modules within each scheme that allow members to opt for varying degrees of ambition, are leading to a watering down of sustainability outcomes in general. For too long, certification has been considered as the one and only “possible and realistic” option for addressing the impacts of palm oil cultivation, but the fact is: we are running out of time. This commentary is a response to “Palm oil certification? No silver bullet, but essential for sustainability,” an op-ed Mongabay published on May 25, 2018. Changing Markets Foundation’s recent report “The False Promise of Certification” analyzed the merits of different voluntary initiatives and certification schemes in the palm oil, fisheries, and textile sectors, all of which are notorious for causing extensive harm to the environment. As campaigns director for Changing Markets Foundation, I was part of the team that researched and wrote the report. We set out to critically evaluate what role these voluntary schemes played in advancing environmental sustainability and improving corporate practices in the three sectors. A number of voluntary schemes have been set up to address the environmental impacts of palm oil, which has experienced rapid growth in demand and has been identified as one of the leading drivers of deforestation and biodiversity loss worldwide. We investigated The Roundtable for Sustainable Palm Oil (RSPO), Roundtable for Sustainable Biomaterials (RSB), Rainforest Alliance & Sustainable Agriculture Network, International Sustainability and Carbon Certification (ISCC), and the two schemes established by the Indonesian (ISPO) and Malaysian (MSPO) governments. Our report showed that, while there is some variation between them, none of the schemes has been very effective in slowing down deforestation. The range of schemes, and the existence of different modules within each scheme that allow members to opt for varying degrees of ambition, are leading to a watering down of sustainability outcomes in general. For example, RSB and ISCC offer several different modules depending on which market a company wants to export to and whether its palm oil is destined for food or biofuels. 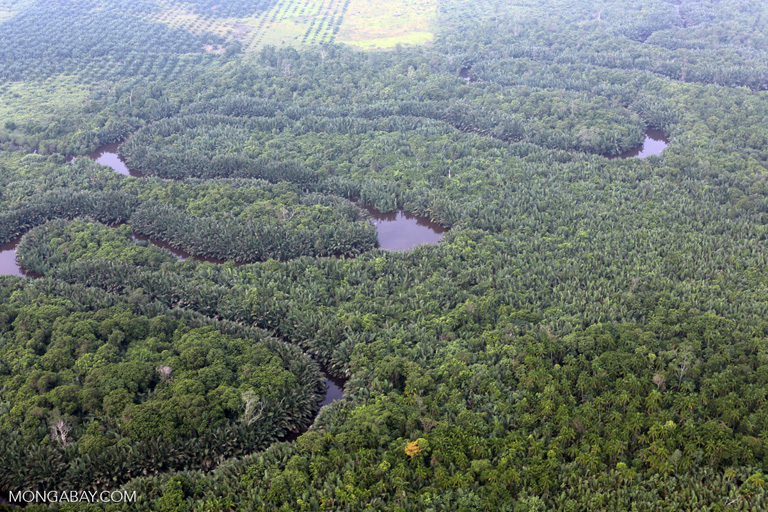 Peat forest and oil palm in Riau, Indonesia. Photo by Rhett Butler. The RSPO has also chosen to develop a voluntary add-on module (RSPO-NEXT) to drive more sustainable practices for a small number of its members, instead of prohibiting expansion of palm oil cultivation on forested lands and peatlands across the board. While not one of the schemes is driving a race to the top by having one ambitious standard, MSPO and ISPO were found to represent a race to the bottom, because they fail to meet even basic requirements for international multi-stakeholder certification, such as third-party audit and transparency. RSPO is often referred to as the best scheme in the sector and has certified over 19 percent of global palm oil production. But our report identified several shortcomings: it allows the conversion of secondary forests and the draining of peatlands, it does not require a reduction in greenhouse gas emissions, and it has not prevented human and labor rights violations. A recent study revealed that, while RSPO has led to a small reduction in deforestation, it mostly certified older plantations where deforestation had already happened prior to certification. It also showed that RSPO certification had no positive impact on peatland draining and forest fires. This is presumably because of its failure to prohibit these activities. Research shows that, due to lax standards and weak enforcement, certification is failing to reward good practices. If good and bad companies alike can get certified, this does not lead to a virtuous circle, whereby responsible companies are able to benefit commercially from their efforts. For this reason, we propose that the least ambitious schemes (MSPO and ISPO) should be abolished, because of their significant deficiencies. Despite the clear shortcomings of the RSPO, we conclude that there is a final opportunity for reform in its 2018 review of the standard. The RSPO should focus on quality rather than quantity and only certify palm oil that is free of deforestation, peat drainage, and human rights violations. Traceability is also a major issue that should be addressed, as NGO studies have shown that illegal palm oil has been traded by RSPO certificate holders. If companies are allowed to just buy their way out of the problem through the purchase of sustainable palm certificates on online platforms, they have no incentive to get their own supply chains under control. What are the solutions beyond certification? Regardless of whether or not reform of the RSPO and other certification schemes succeeds, we propose two sets of measures to increase sustainability in the sector. First, the biggest palm oil importers should reduce their demand and adopt measures to ensure their imports are free from deforestation. The big elephant in the room is the European Union’s (EU) biofuels policy, as almost 60 percent of palm oil in Europe is burned for transport and energy. The policy, which was supposed to reduce greenhouse gas emissions, is a clear failure, as even the EU Commission’s own studies show that palm oil is in fact three times worse for the climate than fossil fuels. Ditching this policy would alleviate significant pressure on forests and also free up large quantities of other vegetable oils that could instead be used in the food sector. The EU should also propose a comprehensive action plan to protect forests, which should prohibit the import of agricultural commodities cultivated on illegally converted forest land and place due diligence requirements on companies. Secondly, for producing countries, our report recommends several measures that include implementation and effective enforcement of forest conservation policies, including the introduction of an immediate moratorium on deforestation and peatland conversion. Progressive companies can lead this effort, similar to what happened with the adoption of the successful soy moratorium in the Brazilian Amazon. Instead of the uncontrolled expansion of palm plantations to forested lands, companies and governments should invest in efficiency improvements and channel new plantations to non-forested areas and on degraded land. While reformed certification schemes could potentially become a tool for consumers to identify more sustainable products again in the future, we must recognize that they cannot and should not replace government regulations and responsible corporate behavior. For too long, certification has been considered as the one and only “possible and realistic” option for addressing the impacts of palm oil cultivation, but the fact is: we are running out of time. We need to focus our efforts on real solutions that protect forests and majestic species that depend on them. 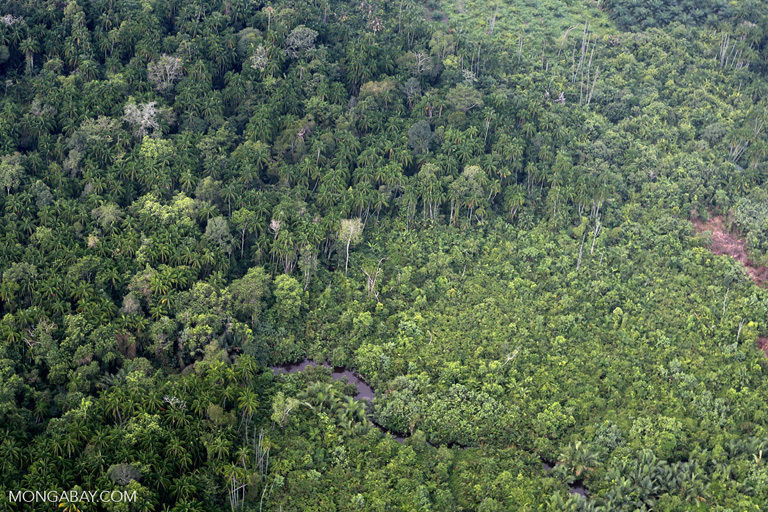 Peat forest in Riau, Indonesia, with deforestation for agriculture visible in upper left. Photo by Rhett Butler. 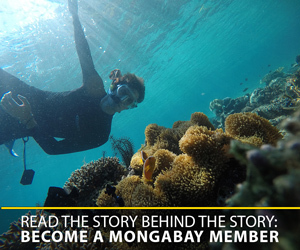 Nusa Urbancic is Campaigns Director for Changing Markets Foundation.